CO2 sensors employing a single detector element typically utilize gas concentration correction software with the assumption that CO2 concentration in unoccupied space is around 400ppm. However, in an environment where many occupants are present at all times, or when CO2 gas concentration remains in excess of 400ppm, ambient CO2 concentration never falls to 400ppm, resulting in less accurate measurements due to inappropriate software corrections. The CDM7160 employs two detectors with different optical filters in front of each detector. 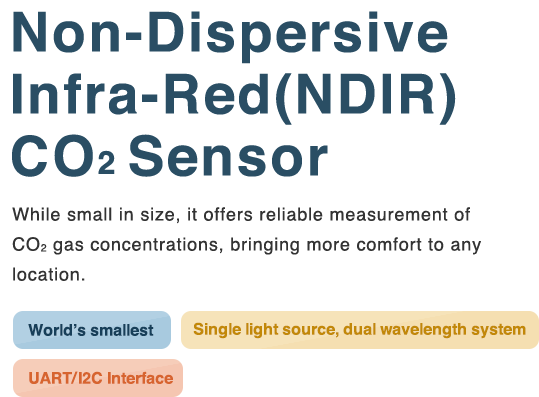 One detector measures the intensity of transmitted infrared light of the wavelength region that is absorbed by CO2 gas (i.e. 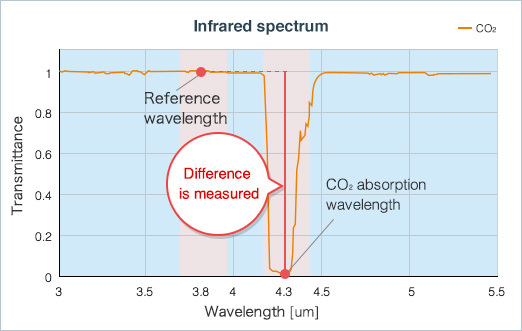 the CO2 absorption wavelength). The other detector measures the intensity of transmitted infrared light of the wavelength region that is not absorbed by CO2 (reference wavelength) and unaffected by CO2 concentrations, enabling effective correction of CO2 measurements. CDM7160 measures infrared light intensity at the reference wavelength simultaneously, and calculates CO2 concentrations from the difference between light intensities at the CO2 absorption wavelength and the reference wavelength, resulting in accurate and stable measurement of CO2 gas concentrations. The CDM7160 employs a single light source, dual wavelength system using two optical filters and measures intensities of the infrared lights at two different wavelength bands passing through each of the optical filters respectively, resulting in accurate measurement of CO2 gas concentrations. Furthermore, stable sensor output throughout a long period of operation is achieved by proprietary signal processing technology. Accuracy decreases when used in places where CO2 concentration remains high due to continued presence of occupants, such as small retail stores or hospitals. High accuracy is maintained by comparing IR intensities of two different wavelength bands even when used in applications where people are continually present, such as small retail stores or hospitals. Compact size with thickness of only 7.5 mm fits in well with low-profile environmental monitors or controllers. Measured CO2 concentration data can be output to a PC or external control device via UART (Universal Asynchronous Receiver Transmitter) interface, which is embedded into most of the latest microprocessors. 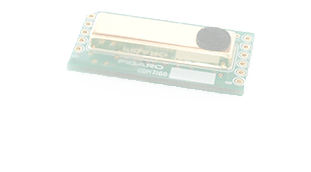 The CDM7160 also incorporates an I2C (Inter-Integrated Circuit) interface for high-speed communications between the CO2 sensor and peripheral devices that are directly connected within a short distance. The I2C interface is not suitable for communication with remote devices. By connecting the CO2 sensor with an external microprocessor via the UART interface, measured data can be sent to or be received from a variety of control devices and equipment through the microprocessor. By utilizing a microcomputer with communication functions, CO2 concentration data can be transmitted wirelessly for remote control operations. Based on the in-depth knowledge and expertise that Figaro has acquired through its 45+ years of experience in supplying high quality gas sensing solutions to global markets, Figaro provides sound and responsive technical support for application circuit design, selection of electronic components, detector housing design, gas detector manufacturing process, and other customer-specific technical questions. Individual product data sheets, detailed technical information and application notes are available for customer’s reference. Suitable for a wide range of applications such as ventilation control equipment, air conditioning equipment, and small measuring devices for indoor environmental comfort and energy efficiency. Expected application includes input devices for environmental measurement in IoT and M2M products. All CO2 sensors are factory calibrated to standard CO2 gas in a computer-controlled automatic calibration system. Stringent quality control processes at Figaro ensure high reliability of its gas sensors. 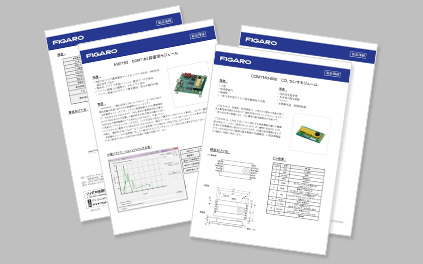 Figaro has a wide range of product lines, including semiconductor VOC sensors for detection of low concentrations and battery operable electrochemical CO sensors. Figaro is one of the few gas sensor manufacturers in the world supplying VOC, CO, and CO2 gas sensors. Click the model number for more details.